“SW Day Rides” originally appeared on our website in 2011. We were touring the SW for the first time and were in a rented RV without our bikes. We eagerly studied biking opportunities in anticipation of riding them one day. Since then, we’ve actually ridden some of those routes and have added others to this file. Below are brief descriptions of short day rides in Arizona, California, Colorado, Idaho, Nevada, New Mexico, South Dakota, Utah, and Wyoming. The rides are alphabetized by state and nearest city. There are 3 rides at the Grand Canyon: a fitness ride to the east on a main park entrance road; a social/sight seeing ride west from the Visitors Center to The Village and possibly on to Hermits Rest, mostly on bike paths; and a mostly unpaved ride to the village of Tusayan outside the park. Given the South Rim is about 7,000’ above sea level, any ride at the Grand Canyon will be a strain for most people and even after 10 days of altitude acclimation, we gasped for air on every incline. Bikes can be rented at the Visitors Center. We first chose the fitness ride, which was much tougher than we expected. The elevation change on the 19.5 mile route between our Trailer Village near the Visitors Center and the Tusayan Museum & Ruin on Desert View Drive/Hwy 64 is about 200’ but the elevation gain, which includes all of the ups and downs, is 1300’ 1 way. We had intended to ride 3 miles farther to the Desert View Watchtower at the eastern end of the park but thought better of it. With an eye to sunset and concern about the headwinds slowing our return, we opted to not add another 6 miles RT to the ride. Though harder than expected, especially given we’d only had 1 rest day since our epic hike to Phantom Ranch and back, we enjoyed the ride and would do it again. It’s a 45 mph speed limit road with good asphalt and essentially no shoulders but all of the drivers were on their best national park behavior—they were all very courteous and we never felt threatened. There are very few good ‘drive-by’ views from the road, which reduces the distraction level of the drivers. There are a number of easy-to-use pull-outs at viewpoints which invite a quick stop rather than looking over your shoulder while driving. About half of the route, starting near the Kaibab Trailhead, is a cougar corridor. It’s only noted by a single road sign in each direction. I wouldn’t hesitate to ride alone through this corridor but I wouldn’t recommend picnicking alone or peeing in the bushes, just to be safe. There are pit toilets at the Kaibab Trailhead, Grandview Point, Baggeln, and the Tusayan Museum. I assume the toilets at Desert View are of the flush type. We rode in March and the water was shut-off at Tusayan Ruin though was available at the Desert View Watchtower another 3 miles on. The Kaibab Trailhead also has potable water. I would avoid being on this road near sunset. Drivers and photographers get a little frantic to position themselves for the best sunset shot or squeeze in one more viewpoint. It’s just as well to be off the road before the distraction level of the drivers shoots up and it’s likely to start getting cold. No bikes are allowed along the Rim Trail until you intersect it a little east of the Visitors Center. Then you can enjoy a rim ride for about two and a half miles to the South Kaibab Trailhead where the bike path terminates and you continue east on Desert View Drive. All of the park's main indoor attractions are on the rim and almost all of the Rim Trail is in a ‘no go zone’ for bikes, which is a shame. Parts of the trail are often packed with pedestrians, so it is prudent. But you can use other paved bike paths to travel parallel to the destinations for a forest view of the park. The straight-line distance between the Visitors Center and the Village is about 2 miles one way but it's a little longer on the bike paths. It’s a little over 200’ in elevation gain round trip with no steeps spots. It’s about a 20 mile round trip ride with around 1500’ elevation gain from the Visitors Center to Hermits Rest with some brief 8% grades. Riders use a combination of the dead end road and a bike path to ride the 7 miles from the Village to Hermits Rest. The road to Hermits Rest is closed to private vehicles from March 1 until November 30, resulting in a 2 lane wide bike path most of the time. Bikes are required to stop to let the buses pass. The bus drivers will not go around bikes if they are moving and some drivers will not proceed if they have to cross the centerline to pass you even if you have stopped. This is a stunning ride with multiple viewpoints of the canyon. One gets a different experience of the canyon at this, the more western end. There is no water for the 7 miles between the Bright Angel Lodge area and Hermits Rest. Some food is available at Hermits Rest though we didn’t check it out. Pit toilets are available at the terminus as well as at several of the many bus stops along the way. The buses have bike racks so taking the bus is an option if you experience an equipment or rider failure. The park map indicates that there is a paved cycle path offset from, but paralleling the park's South Entrance Road. It’s a segment of the 800 mile long, north-south Arizona National Scenic Trail. The online information and photos indicate that it is a mountain biking, hiking, and equestrian route with no mention of asphalt. We rode about 2.5 miles of the 6.7 miles to the community of Tusayan, which is outside the park. The asphalt ended at about the 2 mile point and we turned around after a half mile on the crushed rock surface. It was too rough for our fat road bike tires. We accumulated about 300’ of elevation gain in our brief round trip. Look for the signs to “Tusayan” on your right while you are riding towards the end of the Mather Campground dead end road. We saw many bike lanes as we spent hours circumnavigating Phoenix to get to our RV park but our cycling friend who was living there didn’t recommend the biking. In her experience, too many of the police shared in the belligerent attitude of too many locals that cyclists were fair game for clipping. It seemed that more than half of the 76 campsites had mountain bikes parked in front. If you are inexperienced with cactus spine punctures, I’d recommend calling a couple of Phoenix area bike shops and asking for their tire/liner recommendations for McDowell Mountain. Apparently running over rattlesnakes on the trails is a fairly common experience and usually the snake survives and doesn’t bite. There is some nice road riding available on the long approach to McDowell in the nearby sprawling Phoenix exurbs at Fountain Hills and on Shea Blvd south of Fountain Hills. Tire protection against the cacti and goat head is probably also advisable on these roads. The campground at McDowell Mountain is delightful. Our space #57 was the last slot open when Bill booked online a week in advance and we hoped it wasn’t the dregs. Far from it: it looked to be the best spot in the park when we arrived. We had a 180º view from our picnic table that was free of any structures: we saw only the dense desert vegetation and the distant mountains. The best showers were however at the far end of the loop from our campsite but they were worth the extra walk. Water and electric hook-ups and a dump station are the standard services. We enjoyed the one interpretive hike we attended with the park ranger. February and March are the campground’s peak months, so book in advance for that interval: www.maricopa.gov/parks. Riding Highway 179 between Sedona and the Village of Oak Creek south of Sedona will deliver many grand views of the stunning red rock scenery. Relatively low traffic speeds, good asphalt, stretches of divided highway, and bike lanes made it look like a fine ride of 10-15 miles round trip. You’re at about 4500’ and the road is anything but flat, so it will be a good workout for the distance. The “Pink Jeep Tours” rigs were a sure sign of a tourist-friendly area. Park for free at the US Forest Service Red Rock Ranger Station a little south of the Village of Oak Creek. While there, go into the visitor’s center to learn about the parking permit requirements in the greater area. The Ranger Station is about where the bike lane heading north begins and you will do most of the elevation gain on the way to Sedona, making the return trip easier. Free parking is also available in Sedona should you prefer to ride the other way. Services are available along the sprawl at both the Village of Oak Creek and at Sedona. A number of view points make it easy to get off the road, at least 1 with toilets. There is little or no shade outside of the urban areas and probably no water. Remember to bring your camera. I personally would not ride 89A north of Sedona on the way to Flagstaff. The segment through the dramatic gorge is a very steep, very windy, and very narrow road and has people like us on it in a rented 25’ RV that have their hands full staying on the road without worrying about the needs of cyclists. There were no cyclists on it when we rolled through. Tucson has developed a world-class bike system, at least from the bit of it that we have seen. In December, we rode out 17 miles from Catalina State Park in the northern Tucson exurb of Oro Valley towards town on "The Loop". The Loop will soon be a 130 mile route of multi-use paths and bike lanes that connects with many, many other routes. Our portion was all lovely, swept asphalt well out of traffic. We crossed a single, minor street with pedestrian light on our route which followed a wash for about 10 miles. 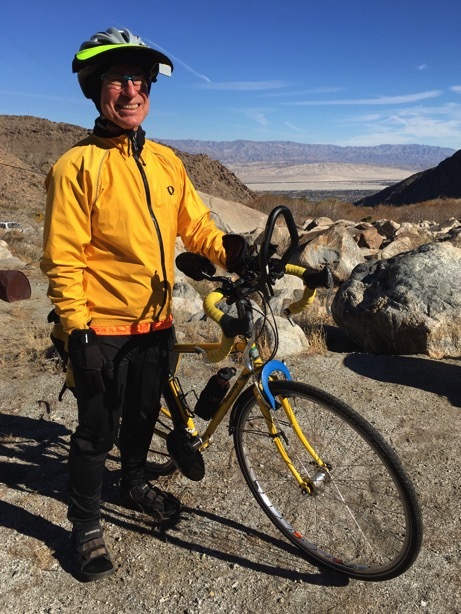 Unlike a similar system near San Bernardino, CA, there were no homeless encampments or heaps of garbage to spoil the tranquility of the ride. We occasionally passed parks and toilets and multiple access ramps from unseen parking lots. It was midday on a Sunday and most of the guests were cyclists with only a few walkers. Everyone was well behaved and courteous. We had a delightful ride and will do it again. The only oddity was that there were no maps or sign posts indicating where we were or where most of the side paths went. For more information: www.bikeped.pima.gov/TheLoop or drop TheLoop for a bigger picture. The 9 mile, one-way scenic drive was wildly popular with local cyclists. Some drove in and parked, others pedaled on the feeder bike lanes. Stretches of it are wickedly steep for a series of short, tight roller-coaster up’s and down’s. There is fresh water and shade at the Visitor’s Center at the entrance with artificial shade and pit toilets available at a couple of other points. The $5 fee per bike or pedestrian entitles you to entry for a week, $10 per vehicle, or use your National Park pass. In November of 2011 on a 2nd trip to the SW, we did a nice training ride in Death Valley from Stovepipe Wells Campground sort of west on Hwy 190 to Emigrant Campground/Day Use area. It took us about 90 minutes of pedaling (plus water stops) to ride the 9+ miles with over 2,000’ gain and about 30 minutes to coast down. This nice but not stunning ride is good if you are needing to put on some miles. It’s posted as 4-6% grades most of the way and this is definitely a ‘road less traveled’ in Death Valley, so the traffic is light. The Emigrant Day Use area has flush toilets, potable water, a pay telephone, and shade--all of which are hard to find in the Park--making it a worthy destination. I was glad to have a jacket, fleece shirt, and full finger gloves for the chilly, low-effort descent. At our turn-around/lunch stop below the Tram station. Palm Springs and the neighboring communities in the Cochella Valley have an emerging bike network. It’s primarily flat city riding, both in and out of traffic. Rather meager route maps are available online and at tourist info downtown on Belardo St. In addition to the city routes, there are 2 classic hill climbs. We did the Tramway Road ride from our RV Park at Hwy 111 (N Palm Canyon Dr) and Mesquite Avenue. It’s about 4 miles and 35” of easy going, warm-up riding on the back streets through lovely residential areas almost to the intersection with Tramway Road on Hwy 111. We stopped to use the public restrooms at the Tourist Info Center at the junction which are open during business hours, then tackled the hill. The climb is about 3.5 miles long with 10-14% grades. It took us 50 to 60 minutes to go up on Tramway Rd on the multi-use path and about 15 minutes to zip down on the street. Bikes are no longer allowed past the lower parking lot gate. I suspect if you want to walk uphill to the lower tram station that the gate attendants will require you to leave your bike at the tiny bike rack. Instead, we pushed our bikes off the road at the gate into the dirt and sat on the boulders for our picnic while enjoying the view of the valley before descending. It can be a hot ride and sometimes the wind kicks up in the area, making it difficult to track a straight line on the ascent. We haven’t done the other obvious climb, which is from Hwy 111 in Palm Desert. You head roughly south on Hwy 74/Pines to Palms Hwy towards Cahuilla Hills. This is a much higher-traffic, through road that goes into the mountains unlike the Tramway Road ride that is up a dead end street. There is however a nice opportunity for a fully-featured rest stop with shade at the Santa Rosa & San Jacinto Mountains National Monument Visitor’s Center 3.5 miles up the hill on your left. In 2015/6, the winter hours were 9-4 Thursday-Monday. The Santa Ana River Trail is a planned but as of yet incomplete, 100 mile (some say 150 miles), paved, multi-use path that has long been under construction. The plan is to connect Huntington Beach on the Pacific Ocean with Bear Lake in the San Bernardino mountains—an enchanting goal. We rode about 19 miles (1 way) of one of the completed segments from the San Bernardino trailhead to the Hidden Valley Wildlife Area beyond Riverside. We were told that we could have continued on to Huntington Beach by transiting on a single segment of side streets. Our route was basically flat with some “rollers” as the path goes under roadways and follows the terrain contours. We started at about 1,000’ elevation and accumulated only about 740’ of elevation gain round trip. Even though it is completely traffic-free, there are a number of well-designed access points to the route. The fee for parking at Hidden Valley Wildlife Area, our turn-around point, is $5. “River Trail” conjures delightful images of cruising along a river listening to birds and admiring nature. Alas, not so with this route. Here, the Santa Ana River is often a trickle in a broad flood control wash overgrown with scrub and we were told that most of its volume here comes from Riverside’s sewage treatment plant’s discharge. Homeless encampments and their garbage pepper the route. Looking beyond the wash, one usually sees the backyards of light industry. The last 2-3 miles of the Trail is in the Wildlife Area and is refreshingly green and pastoral though not wild by our standards. Hardly a glamour route, we and dozens of other roadies were grateful for the long distance ride completely shielded from traffic (if you dodged the detour mentioned below.) It’s a great speedway for fitness riders and there were surprisingly few families given the wide path and pleasant temperatures on a Saturday afternoon. Even though the scenery was a disappointment, we rode it a second time for the exercise. 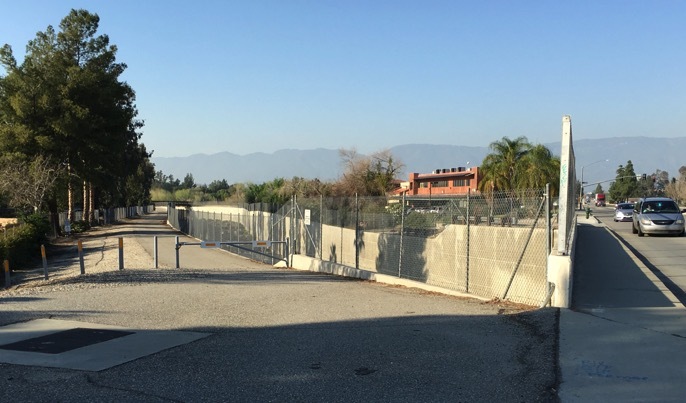 It’s easy to overlook this alternate, but more visible, trailhead for the Santa Ana River Trail. We were overly obliging and followed the detour signs when the route T-boned with a large Riverside sports complex. The regular route was a sharp right hand turn but we followed the orange signs to the left. Initially we enjoyed the detour that had us cruising along broad residential streets but then it dumped us onto a busier street. Our bike lane immediately became a “multi-use” lane with curbside parking. Cars were legally parked over the bike route markings on the pavement and we were in traffic. It wasn’t perilous but felt quite rude given the River Trail had been out of sight of traffic. On our return, we noticed a construction sign indicating the River Trail was open to the public on holidays and weekends and given we were riding on a Saturday, we stayed on the route for our return to San Bernardino. We drove the I-10 from Banning to San Bernardino, exiting on the S. Waterman Ave. ramp. We took a left on Hospitality Lane, then a right onto Waterman to drive by the 2 adjacent trailheads only a few blocks down Waterman on the left. They are about equidistance from the intersection with E Vanderbilt Way and access the San Timoteo Wash area. There is a Days Inn immediately to the left of the first access point. There is no designated parking available at either trailhead and only the second one is marked. After locating the trailhead, we looped back to find parking in one of the strip mall lots. I suspect that the cycling opportunities in Colorado are abundant. We were stunned to see a paved bike route at a mountain pass west of the Eisenhower Tunnel on I-70. Bike routes were also in evidence when we drove through the cities. Grand Junction has an extensive urban bike path network. We rode round trip from our RV Park at the end of the route in Fruita to Eagle Rim Park in Grand Junction and intersected many other routes. Our ride was about 30 miles RT with 300’ of gain. Most of the route was on paved, dedicated multi-use path well out of traffic. There was limited access to water and toilets along the way. We were quite disappointed that biking wasn’t really an option in Mesa Verde but we had to agree that the published statement "bicycling is not recommended" was well founded. The narrow roads were very well maintained but shoulders were often non-existent and the drop-offs were frequently a thousand feet or more. Plus, the sometimes stunning views meant that drivers might not have their full attention on the road. Too bad cyclists weren't allowed to ride on the major road in the Park that is only open to vehicles during the summer—there is nothing better than cycling on a closed road. Boise has a well-developed urban bike system. Should you be tooling along I-84 with a bike in tow, take time out to enjoy a ride on the Boise River routes. Whether you are in the mood for a "La-de-da, it's a beautiful day" ride or are itching to get your heart rate up, you won't be disappointed. We parked our rig for free at the lovely Ann Morrison Memorial Park in central Boise and rode east along the river to Lucky Peak State Park for a 23 mile round trip event. The warm-up was at slower speeds while the path wound through the university campus and through some neighborhoods but then it left the urban scene and traversed the dramatic basalt-lined river gorge. Occasionally there are 2 or 3 dedicated bike paths paralleling the river which helped keep the route interesting. Going west from our parking spot would probably make it about a 30 mile outing, though there would likely be more pedestrians on that segment of the path. We anticipated a lovely ride along the dramatic Snake River gorge while in Twin Falls but once we had their bike map in hand, we realized the route was in the “bits” stage, with most segments being less than a mile long. We struggled to connect its brief segments of bike routes and couldn’t avoid being in some very dangerous traffic in the process. We won’t bother with it again. Red Rock Canyon is one of several places called “Red Rock” in the SW. The main feature of the park--well, not technically a park but I’ll call it that for ease--is the one way, 13 mile Scenic Drive. There is about 1400’ elevation gain on the route, with 1100’ of it in the first 5 miles. Your starting elevation is about 3800’ and the high point is about 4800,’ so you may feel a little extra effort because of the elevation. Stunning views, a wide road, and sedate traffic makes this a world-class ride. (A cyclist volunteered that the park was 5th in the world as a rock climbing venue.) The total mileage is about 15 miles because the Scenic Drive exits onto the highway about 2 miles from the Visitors Center where we parked. Take a left onto the highway and enjoy the bike lane back to Red Rock. Best to take your proof of payment with you because you have to re-queue at the controlled entrance gate to return to your car. Bring your own food and water because the only chance for water is near the entrance gate at the Visitors Center and there is no food service available. No-flush toilets do pepper the route but unlike some national parks, lack hand cleaner. Aggressively prepare for the weather. Bring a ton of water if it might get hot as there is little to no shade and no water along the way. And bring what you need for a long, bone-chilling descent if the temperatures are on the cool side. Might as well be prepared for a lot of wind too. Oh, and be sure to bring your camera. Cyclists currently pay a $3 per person entrance fee but you’ll save money by paying the $7 car load fee if 3 or more of you drive your bikes into the park in a single vehicle. This is a BLM property, so your America The Beautiful Annual or Senior Pass will give you free entry for your car load. Many cyclists make a long ride out of it by biking from Las Vegas on bike lanes, which is very roughly 20 miles away. There is a housing development where the road to the park shrinks to 2 lanes and there was a sign for an Albertson’s grocery on the premises. Perhaps one could park their car in the retail area (which we didn’t explore) and bike roundtrip through the park from it instead of all the way out Cheyenne Avenue, much of which is intense urban traffic. We however opted to make it a moderate ride by doing the loop twice, which spared us from being in noisy traffic at twice the speed of that within the park. This is a 35 mile paved, multi-use path closed to traffic that loops around a mountain base as it parallels Lake Mead for roughly 1/3 of its length. We were longing to bike the entire route after walking about an hour on it. If you are arriving from Las Vegas and aiming towards the lake, consider going counterclockwise on the bike route because that direction might deliver the best views of the lake. We don’t know what the actual elevation gain is though the elevation change is stated to be 1300'. Bring your own food and water as it appeared from the map that there were no services along the way. On the east side of the city, parallel to but east of I-25, is a beltway road “Tramway Blvd.” Look for the National Forest road #333 off of Tramway that turns uphill into the mountains. If you are needing to clear out that stale glycogen from your muscles, join the riders that turn off of Tramway onto #333. The paved part of the windy road up to the La Luz trail parking lot ends after 2.2 miles and almost 900’ gain. We were very carefully driving our 25’ rented RV on segments posted at 10 mph that seemed to be in the 20% grade range. Very narrow, no shoulders, but good asphalt and all of the cars crept along. Pit toilets, no water, no shade is your reception. The hiking trails from La Luz are delightful: grit rather than broken rocks on most of the surfaces and grand views. Droves of cyclists ride the wide shoulders of Tramway Blvd despite the fast traffic. It is apparently illegal for them to be on the stretch of Tramway Blvd that is flanked by the multi-use path that begins at the intersection of Tramway Blvd and Tramway Road and continues south. The woman at the Performance Bike Shop in Albuquerque said that she does not ride on the city’s roads because it is too dangerous. A belligerence on the part of some of the motorists makes it unsafe in her mind and she sticks to the multi-use paths out of traffic. Unfortunately, their biking culture is at the awkward stage in which the pedestrians believe the bikes belong on the road, so they too will bully cyclists. But given that for the first quarter of 2011 Albuquerque motorists were killing an average of 1 cyclist a week on the roads, she preferred to take her chances with the hostile pedestrians. Check the local bike shops for a free map of Albuquerque’s bike routes or go online: www.cabq.gov/bike/ for more information. We park our rig for a month at the “Journeys" KOA on the east edge of town and delight in biking from our door on a sequestered bike path adjacent to I-40 and then into the hills on Old Route 66 (as well as hiking from the 3 Gun Trailhead a 10 minute drive east of the KOA on the same road). There still seems to be an attitude problem with the drivers and so we deliberately ride on the weekends because both the cyclists and police are on the route in droves. It very much seems like a “safety in numbers situation” and we’ve never been treated with anything but courtesy on these rides. 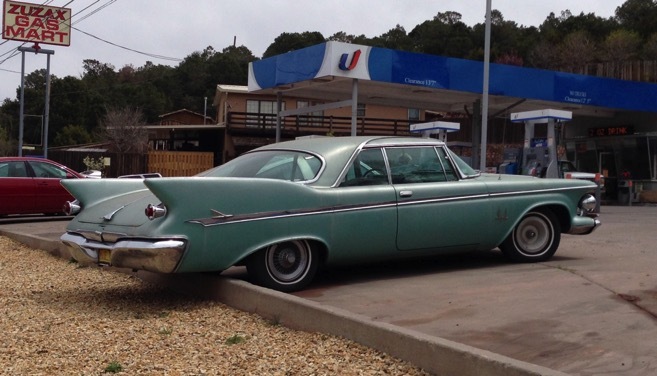 In 2016 we were pleased to see a number of upgrades on our Route 66 ride to Tijeras. The early part of the ride had wide bike lanes that curiously had no bike lane markings. There were “Share the Road” signs but no designation of the lanes for bikes. It looked like a casualty of some rules war but only bikes were using the space. A little Rte 66 nostalgia on our way into the hills. A bonus for us is the Tijeras community center complex housing the East Mountain Library on Rte 66 just west of the major interchange about 8 miles from our RV park. The few picnic tables that we often use are too close to the freeway for a tranquil stop but the clean, modern public restrooms are a hit. We can refill our water bottles there, if needed. Many local riders use this parking lot to stage their rides into the hills. There is also a small market and food stops closer to the interchange of I-40, Hwy 337, and Hwy 333 (Hwy 66E). We typically ride 30-40 miles, picking up 2,000-2,500’ of elevation gain in this area. We rode beyond the Sedillo overpass once and won’t do that again. The road narrows, the pavement degrades, the winds are more annoying on that side, and we felt like we were on borrowed time. Instead, we are now exploring side roads to the north and south of Rte 66/I-40 before the Sedillo overpass. Our Albuquerque KOA is about 5,500’ above sea level and Tijeras is 6,300’, both high enough to start feeling the extra effort on the uphill. Wind is always a possibility here, especially in the afternoons. The George S. Mickelson Trail was a surprise find on our hiking recon trip to the Black Hills. It is 109 miles of a ‘rails to trails’ route that runs north-south through most of the length of the Black Hills National Forest. It has a nice grit and crushed rock surface. The grade rarely exceeds 4% but nonetheless, it is considered strenuous and is not recommended for skinny tires. We rode the 10 mile long segment between Hill City and The Mountain Trailhead. Our starting elevation on the uphill side of Hill City was about 5,000’, which is the elevation that causes most of us to start huffing and puffing with exertion. The crest was 5885’ though our total gain for the RT was 1050’. Experienced road bike riders on skinny tires would have no difficulty on this segment of trail. Applying ourselves on our heavy touring bikes, we rode uphill just under 7 mph. It took us about 90 minutes to ride the 10 miles. On the return trip, we were coasting at 14 mph on the early, steeper part of the descent and often rode 10 mph lower down with some pedaling. It’s a “Pay to Ride” Trail, with the day pass being $3/person and the annual pass being $15. There was a payment box near the start of our ride. We noticed a bike rental and shuttle service business that was closed for the season outside of Hill City and I suspect that there are others elsewhere on the trail. 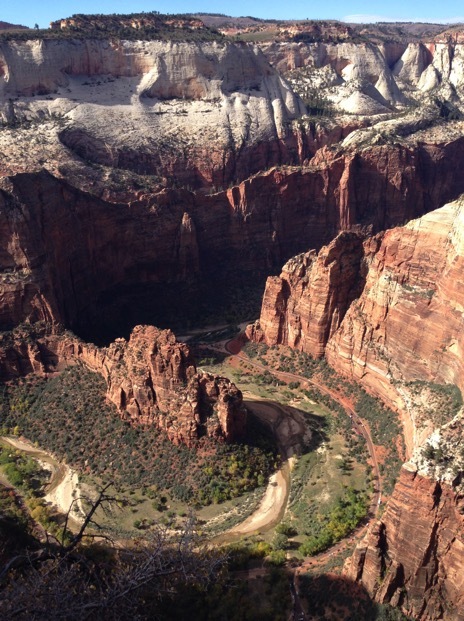 The road & river in Zion Canyon from Cable Mtn. We rode uphill from the Snow Canyon State Park campground and Visitors Center on the paved bike path until it ended, then took to the road and continued to the park’s upper entrance gate. There we turned right to ride the path along Hwy 18 towards town. So far so good on what is known at Snow Canyon Trail or Snow Canyon Loop. Then we starting hitting the 20% grades, which were a test of my courage on our predominantly downhill route. I was shocked to encounter what seemed like an “expert’s only” trail in such a bike-friendly town. I guess if I were to do it again, I’d ride in the reverse direction and hope to be able to pedal up the toughest grades to condition my muscles rather than my nerves. This was about a 15 mile loop and well over a 1000’ of gain, though we didn’t get a good reading on it. Unless you are already camping in the park, you’ll have to pay the $6 entrance fee. A better bet for most riders would be to do the short out-and-back within the park or hook up with the other bike paths in St George. We usually ride on the Pa’ rus Trail from the Watchman Campground near the Visitor’s Center along the Virgin River to the junction with Zion Canyon. Once there, the lovely multi-use path dips under the road and then abruptly ends at the beginning of the Zion Canyon Scenic Drive. From there, we ride on the road to its end at Temple of Sinawava where there is drinking water and flush toilets. It’s just under 17 mile RT and about 600’ of elevation gain. The deep shade of the narrow canyon can make it chilly at the road’s end even on a warm day so consider taking a jacket. When the shuttle buses are operating, there is little traffic on Zion Canyon Drive. Cyclists do however need to stop when being overtaken by a bus because the drivers are not allowed to pass cyclists. 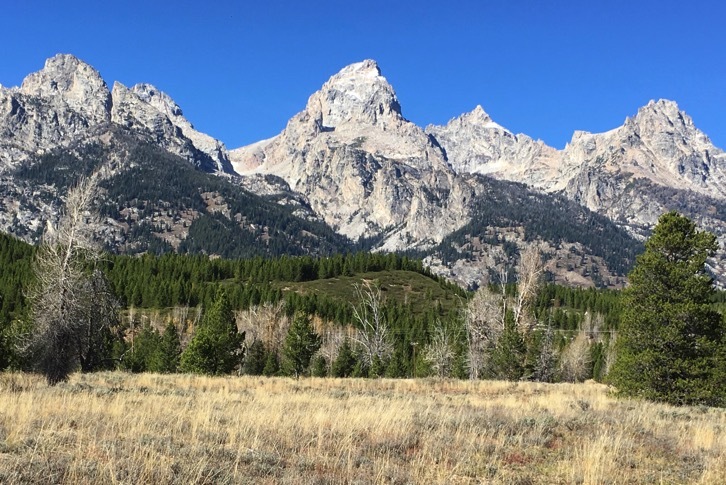 Grand Teton National Park was our reason for being in Wyoming in 2015 but we couldn’t help but notice the inter-city bike routes along the way. I would expect online searches for bike routes wherever you are in Wyoming would be worth the effort. We came for the hiking but the lovely, paved, multi-use path nicely off the road is what held our attention the first day we drove into Grand Teton to collect information at the Visitors Center. And indeed, it was a wonderful ride. It’s about 40 miles RT from the city of Jackson, WY (near Jackson Hole) to Jenny Lake in the park with about 1000’ of elevation gain. Grand Teton seen from the bike path. There is a surprising shortage of picnic spots along the way but there are toilets and water at the Visitors Center, which is roughly at the midpoint, and seasonally at Jenny Lake. In the off-season, which is when we were there, there was no water but pit toilets only at Jenny Lake. There are also toilets at a trailhead parking lot closer to Jenny Lake. A strong wind came up every afternoon for the 8 days that we were in Grand Teton and of course, that intensified our workout. We rode RT from our RV park in Jackson, which put us riding back directly into the wind in the afternoon. That experience did explain why so many cyclists were driving to Jenny Lake and doing their RT from there. We rode out to Jenny Lake at a sightseeing pace and did most of the gain for the ride in just over 2 hours. On the return, we pushed hard, rotating drafting and leading positions, which we rarely do. Amazingly, we got back in well under 2 hours despite the persistent, strong headwind. And “Oh yes, the elevation." The valley floor of the Park at the Jackson end is about 6,200’, so you’ll feel the altitude if you are a ‘flatlander’. Given all of the warnings about grizzlies and black bears in the park, Bill carried our can of bear spray in a bottle cage on his bike. We noticed one other guest on the multi-use path with his can handy on his hip. Jackson, the gateway to Grand Teton, also has well developed bike routes. We are definitely roadies, despite our fatter tires, but have one word of advise for the MTB crowd: don’t bike alone in these mountains. Throughout the SW when hiking we see signs warning of cougar/mountain lion sightings though we’ve only seen prints once and that was in an area with no special warning signs. These big cats have no trouble taking down a human and they are more likely to consider a solo athlete easy prey than several together. One info board triggered a strong visual in my mind: mountain lions can leap 23’ in a single bound; mountain lions prefer deer for dinner. We make a point of hiking within feet of each other to have a more threatening presence. The trick is knowing when you are moving in and out of higher risk areas so we always assume they are a threat and behave accordingly. If challenged by a cougar, aggressively fight back rather than be submissive or run away because if you do, you are toast. In 2014, a woman told us of watching a mountain lion stalking her husband when they were probably only a half mile from the highway above Palm Desert, CA. They had split up, she taking the higher trail, and he walking in the wash. She saw the cat stalking him from her elevation on the other side of the narrowing canyon. She yelled, but wasn’t heard by either of them. Luckily, the cat went on without pouncing him or stalking her. Goat’s head thorns and other spiny threats are widespread in the SW, so go prepared with pliers, spare tubes, a good pump, and lots of patch kit material. Liners, Kevlar, Slime, and the other remedies are worth considering, but be prepared for the inevitable. Budget enough time for fixing a flat or 2 when you are planning your ride. And speaking of budgeting time, allow plenty of time to get to your final destination in case the often-fierce winds pick-up in the afternoons.